Q) What is a Display Size of Jio Phone? Q) Processor on Jio Phone? Q) RAM on Jio Phone? Q) Storage on Jio Phone? Q) Does Jio Phone comes with Rear and front Camera? Q) Does Jio Phone comes with MicroSD card slot? Q) Does Jio Phone has support for Hotspot? Q) Does Jio Phone has support for WhatsApp? Q) Does Jio Phone has support for Facebook? Q) Does Jio Phone comes with Torch Light? Q) Does Jio Phone has support for FM Radio? Q) Does Jio Phone has support for NFC? Q) Keypad On Jio Phone? 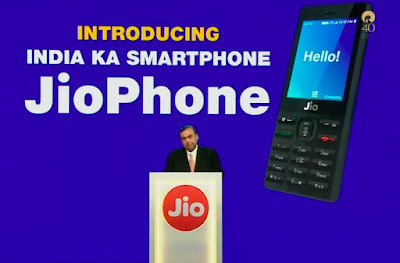 Q) OS on Jio Phone? Q) Jio Phone comes with Dual SIM support? Q) Preloaded Jio Apps on Jio Phone? A) It comes pre-loaded with Jio Music, Jio Cinema, and Jio TV apps. Q) Battery On Jio Phone? Q) Voice Assistant on Jio Phone? A) Jio phone comes equipped with a voice controlled digital assistant. which supports 22 regional languages including Hindi and English. Q) What is Jio Cable on Jio Phone? Q) Plans available for Jio Phone? Q) Is Rs 153 Plan available for All Users? Q) Is der any other Plans available for Jio Phone? Q) Do we need to Recharge 153 monthly on Jio Phone? Q) How to Book Jio Phone? A) The phone will be available for pre booking from 24th of August 2017.The booking can be made on the My JIO app, on the official website of JIO and the JIO stores. The delivery of the phone will be done on First Come First Serve basis which means the users who book first will get the phone delivery first. Q) Price of Jio Phone? A) The JioPhone is effectively free for Rs. 0, Jio will collect Rs. 1,500 fully refundable deposit, which will be returned after three years.